Because she is an Ophthalmologist and Oculoplastic Surgeon, eyes are her first priority. Dr. Sherman is Board Certified and has fellowship training in Oculoplastic and Eye Plastic surgery, so she is uniquely qualified to diagnose and treat eyelid tumors. Dr. Sherman treats a wide variety of eyelid tumors & cysts. Dr. Sherman knows the eye and orbital anatomy to the highest degree. As an Occuloplastic surgeon with over 20 years of experience, she is well qualified to examine you and discuss with you all available treatment options. 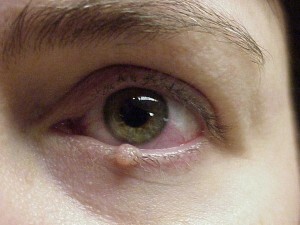 What is an Eyelid Tumor? A tumor is an abnormal growth of any tissue and can be either benign or malignant. Benign tumors typically remain localized, whereas malignant tumors often spread into surrounding areas. Eyelid tumors can affect any part of the eye, including the orbital (eye socket), eyeball, eye muscles, optic nerve, fat and tissues. 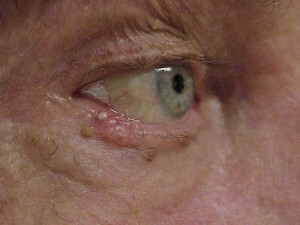 Sometimes tumors grow into the eye area, or a tumor may travel to the eyelid from another part of the body. 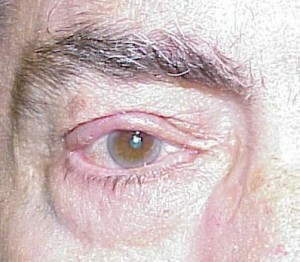 Fortunately, most eyelid tumors are benign. Tumors should be diagnosed immediately, and early treatment is vital in order to prevent possible loss of an eye. Dr. Sherman provides treatment for both types of eye tumors – eyelid tumors and orbital (eye socket) tumors. The following information will help to educate you about eyelid tumors and the importance of treatment. Benign eyelid tumors are very common, and many types occur. The most common types seen in our practice are mole or nevus, papilloma, seborrheic keratosis, actinic keratosis, and skin tags. They can surgically be removed if they cause symptoms or present a concern, but are often left alone. Dr. Sherman will recommend biopsy if a noncancerous diagnosis cannot be made with confidence from clinical examination. Some benign eyelid tumors are considered to be “premalignant” and are therefore best removed. 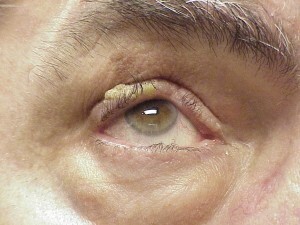 Certain types, if neglected, may spread into the eye socket, which may require surgery to remove the eye and adjacent eye tissue. Basal Cell Carcinoma is the most frequently encountered type of malignant or cancerous eyelid tumor – which can be removed at an outpatient surgery center in conjunction with a Board Certified Pathologist, who can determine if margins are free of tumor. Once all the tumor is removed and margins are free of tumor, Dr. Sherman, a Board Certified Ophthalmologist & Oculoplastic Surgeon, can reconstruct the eyelid in one same day surgery setting.